Home / Executive / Leave it better than you found it! I’ve mentioned before how having a baby in your life changes everything. That includes the choices we make in our daily lives. I want to leave my granddaughter with a beautiful place to grow up, raise a family, have meaningful work – AND be able to enjoy our spectacular natural environment, drink clean water and breathe fresh air. 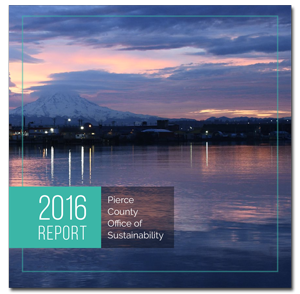 One strategy to deliver that vision is Pierce County Sustainability 2020. The initiative, approved by the Council last year, is an ambitious plan with specific targets for energy use, waste reduction, commuting and other measurable goals. We need to be the best possible stewards of Pierce County and the resources our citizens entrust to us. It is about being smart and sustainable – not just “green for the sake of being green.” Our citizens expect us to be both! There are things each of us can do to improve our environment. For example, switching to LED lights saves money for you – and for Pierce County. LED lights use about 1/5 as much energy as conventional bulbs, saving energy costs. We also have lights that turn off automatically (although I can still hear my father telling me to “turn off the lights when you leave the room!”). Sometimes when I am working at my desk quietly for too long, my office lights go off – a not so subtle reminder that I should stand up and move around! (Speaking of which, did you know the 2017 Pierce County Wellness Challenge starts next week and runs through June 30th? The 2016 Sustainability Report will be released next week, and I’m pleased to see the tangible progress we’ve made over the last year. You can read the entire report here. Many thanks to Ryan Dicks in the Office of Sustainability for his work to keep this initiative front and center for all of us. In another variation on the sustainability theme, congratulations to Auditor Julie Anderson and her team for their recent National Association of Counties (NACo) award for using the latest technology to streamline elections. This video from the Standing Ovation Awards last fall is a great profile of the innovative project. During the 2016 presidential election, the Auditor needed a secure, efficient way to check in hundreds of temporary election workers. Biometric time clocks were installed to streamline time entry for these workers. Now, up to 20 workers can check in per minute with just a swipe of a finger. The new system is expected to save $10,000 per year by reducing staff time spent on payroll processing, while also reducing errors, and eliminating the need for hundreds of paper time sheets – a great example of sustainable and smart! Pierce County is one of the first counties in the Pacific Northwest to use biometric time clocks for elections and other county departments are also adopting the clocks to save time and money. Finally, I wanted to share a recent column in the News Tribune by Heidi Fedora of Lakewood. Heidi’s approach challenged me to leave my neighborhood better each time I am out for a walk!